This has to be the ‘Wine Dinner of the Year’, both in theme and value. If you know your Barolo, $258 per person for this line up of top-of-the-line producers is ludicrously cheap – indeed one bottle of any of these wines would be more than the cost of the whole package and there are some excellent vintages being served up, most now unavailable in current markets. And there is there opportunity to bid for some even rarer wines. If you don’t know your Barolo, then this dinner is even more strategic – that is you will not come across a better opportunity to discover the nebbiolo grape – and the beguiling wines of Barolo that exude such hedonistic aromas and complexities, they even garner the utmost respect from burgundy and pinot noir fanatics – actually one can draw many similarities in the secondary aromas and ethereal complexity of fine pinot noir, only nebbiolo or Barolo as it were, has its unique earthy, cedar forest stamp and unparalleled in its ‘tar and roses’ nuance. 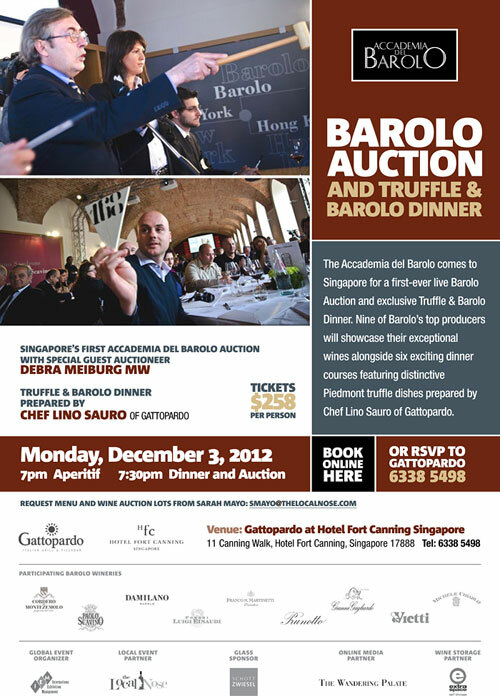 Singapore joins the exclusive list of global cities selected to host the prestigious Accademia del Barolo (the Academy of Barolo) producers for a first-ever live Barolo Auction and Truffle & Barolo Wine Dinner at Gattopardo, located in the Hotel Fort Canning on Monday, December 3rd, 2012 at 7pm. Award-winning Italian Chef Lino Sauro of Gattopardo will prepare a 5 course traditional Piedmont dinner to compliment 9 premium Barolo wines from vintages ranging between 1998 to 2007. 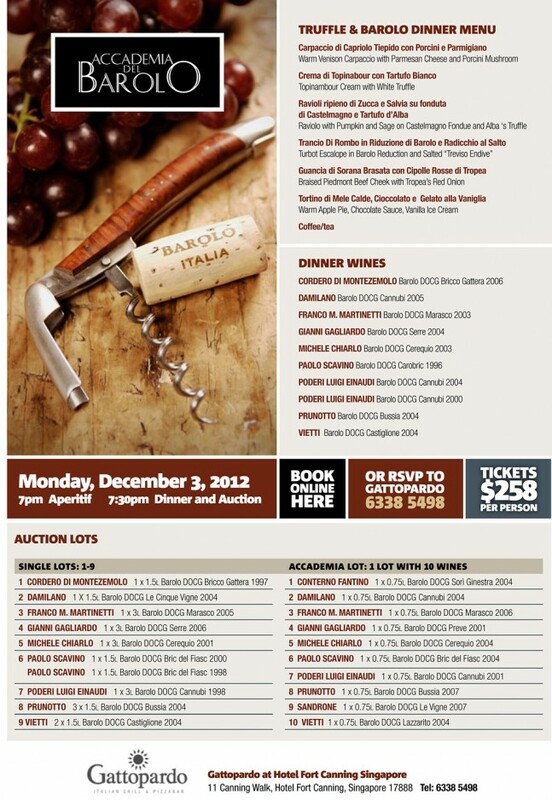 The Auction will feature a total of ten (10) lots of Barolo wines from participating wineries. Nine (9) of the lots will be offered as single winery lots with one (1) lot offered as an Accademia lot comprised of 1 bottle from 10 different Accademia producers. As part of the Singapore event the Accademia del Barolo will host a Trade and Media Barolo Seminar with a guided tasting led by Hong Kong based Master of Wine, Debra Meiburg. Invited wine trade and media will have the chance to preview the esteemed 2008 vintage, learn about the history, tradition and production methods of Barolo, in addition to the stylistic and regional differences of the different crus and communes. Several Barolo producers will present their wines in person at this seminar. The Accademia del Barolo is a Piedmont-based association of fourteen premium Barolo producers founded in 2010 and headquartered in the Castello di Barolo. As a group the Accademia del Barolo is devoted to a collective mission of sharing knowledge about Barolo wines and raising global awareness about Barolo’s quality winemaking traditions. 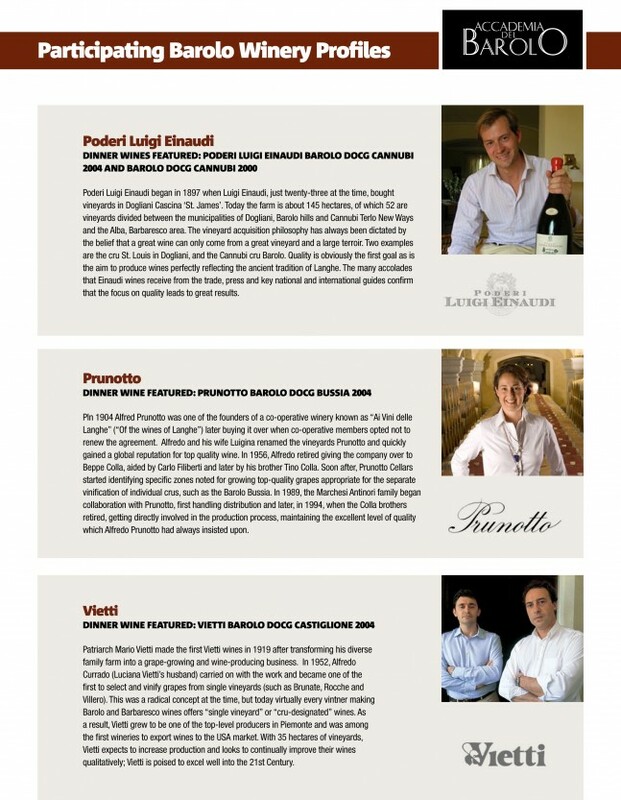 These producers/members all make their wines and share their professional experience, passion and enthusiasm for Barolo at public and private tastings, wine courses and events around the world. Nine of the 14 member wineries will participate in the Singapore trade seminar, auction and dinner with several of the winery owners and principals travelling to Singapore. 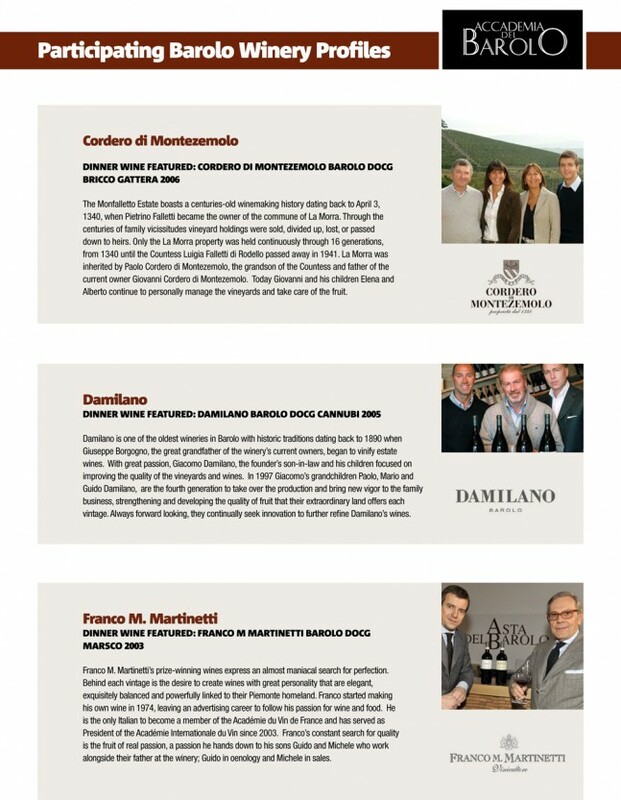 Participating wineries include: Cordero Di Montezemolo, Damilano, Franco M. Martinetti, Gianni Gagliardo, Michele Chiarlo, Paolo Scavino, Poderi Luigi Einaudi, Prunotto, and Vietti. 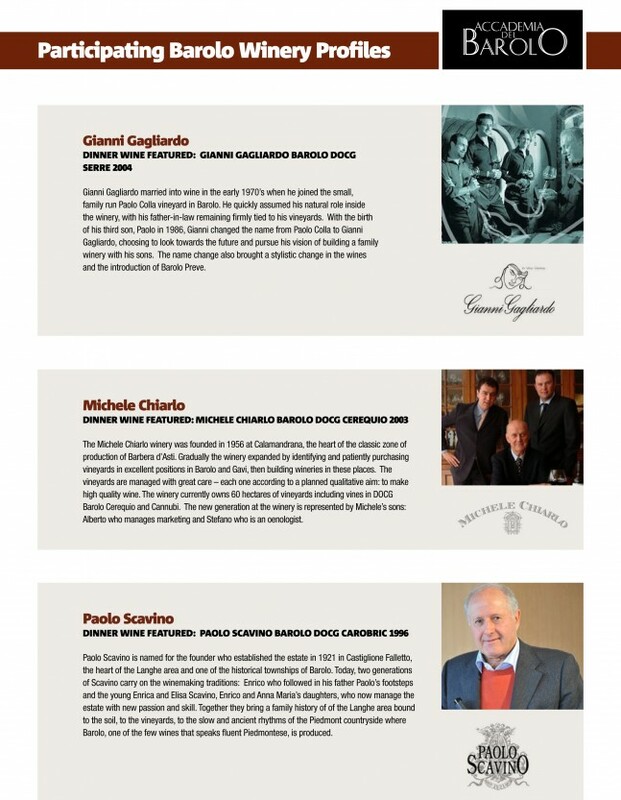 The Barolo Auction (Asta del Barolo) was founded in 1998 in the cellars of Gianni Gagliardo. Since that time the annual Asta del Barolo has gained international recognition for bringing highly qualified wine buyers, wine lovers, and connoisseurs to Barolo for a unique weekend dedicated to Barolo culture and wine appreciation centered on the Auction event at the Wine Musuem in the Castello di Barolo. Building on this rich, Barolo auction tradition, since 2011 the Accademia del Barolo has taken the event global hosting Auctions in New York, Hong Kong and now Singapore. Known as the “Wine of Kings and the King of Wines,” Barolo is regarded as one of Italy’s finest wines, appreciated among wine connoisseurs for its powerful and long-lived expression of the Piedmont region’s native Nebbiolo grape. The wine and region takes its name from a village south of the city of Alba where 5 townships make up the core of production: Barolo, La Morra, Castiglione Falletto, Serralunga d’Alba and Monforte d’Alba. Each of these areas produces stylistically distinct wines owing to the soil and vineyard aspect/position on the predominantly hillside vineyards, with a select few vineyard sites recognized internationally as capable of producing the finest Barolo wines. Pacific Hong Kong International Wine & Spirit Competition. Since April, 2012 Chef Lino Sauro has helmed Gattopardo Italian Grill & Pizza Bar where he brings 25 years of culinary experience to the kitchen to create innovative and authentic South Italian and Mediterranean cuisine. A native of South Italy, Chef Lino grew up on a farm and still proudly calls himself a ‘traditional village boy’. He conveys his pride in Italian cultural and family roots through his inspired traditional dishes made with innovative techniques and fresh, unprocessed ingredients. The Accedemia del Barolo selected Chef Lino to prepare the special Truffle & Barolo Dinner. The Hotel Fort Canning is 5-star boutique hotel nestled between Orchard Road, the Clarke Quay entertainment hub and the Central Business District atop the hill at Fort Canning Park, one of Singapore’s most historic landmarks. Distinctive and charming, the Hotel Fort Canning brings colonial history and modern luxury together to create a one-of-a-kind urban sanctuary amongst Singapore Boutique Hotels. The Hotel is conveniently located near the Battle Box, a must-see for history buffs, and the lush greenery and expansive lawns of the surrounding Fort Canning Park offer a variety of arts, heritage and nature experiences. I.E.M. (International Exhibition Management) is the global event organizer for the Accademia del Barolo. Driven by a passion for trade shows and a flair for flawless organization, I.E.M. was founded in 1999 by industry veterans Giancarlo Voglino and Marina Nedic. A reputation for constantly delivering high quality events coupled with its extensive network of contacts with trade professionals and international press has IEM to become one of the most well-regarded Italian wine event organizers in the world. I.E.M. is partnering with local Singapore wine event organizer and online wine marketing platform The Local Nose.com (TLN). Founded and managed by Sarah Mayo, TLN provides wine marketing, wine event and PR services for global wine brands in Singapore. TLN will be working with online wine media partner The Wandering Palate.com founded and managed by Curtis Marsh in addition to glassware partner Schott Zwiesel that will provide specialized, quality glassware for all events. As wine storage partner, Extra Space Storage will provide cold storage for the specially-imported Barolo wines for the seminar, dinner and auction.